Fujifilm Instax Mini 50s is undoubtedly beautiful of Fuji Instax series. Especially this black piano model looks so smooth and elegant. It has all features of Instax Mini 25 except self-mirror. This camera is not available everywhere like other Instax models also not so popular among Instant photo camera fans like other Fuji Instant models. But Mini 50s is not a bad camera at all. It has some really good features like you can mount it on a tripod. Also, it has this new feature which let you take 2 photos continuously. That’s not all. Self-timer is another cool feature and it has a really good flash too. This new flash automatically calculates surrounding brightness condition and adjust the shutter speed to accordingly. This makes it great for indoor events like parties where you have low light conditions. Its self-timer mode let you take two photos with single shutter click. You are getting a close-up lens for taking photos like flowers, food etc. I have seen this camera only in three themes. Piano Black version, Piano White version, and Mickey Mouse Cheki version. White version and Cheki version are not easy to find. Maybe because everyone wants the black model so stores don’t want to keep the other two. It’s a Mini camera so like all other Fuji Mini cameras model 50s also use Mini film. This type of film is so easy to find and every camera store has it. If not you can buy from online stores and even might get a better deal than in real life stores. Cost per photo print would be around $0.50 US dollars. You can buy a pack of 20 photo paper for just around $18 from Amazon. They have some great deals for bigger packs so if you want to buy a large number of packs better go for one of those big offers. This camera uses 2 CR2 batteries. Now a pair of these batteries cost around $5 – $7 depends on brand but I highly recommend you to buy 2 pairs of rechargeable CR2 batteries with a charger. Make sure to buy batteries from a good brand with lots of good reviews. Rechargeable batteries have more power so you will able to get more photo prints also save you money in the long run. You get as good as you can expect from a modern instant photo camera. Outdoor photos will be great and Flash is a must for indoor photos. Still, you might notice underexposed photo prints if the light condition is bad. You can use light/dark setting to get a better result but still, it won’t be like from Digital camera. If you are in USA or Canada then make sure to check Amazon prices before start shopping for this camera in other places, both local stores and online. Some online store selling this model for unbelievably high prices. For example, I noticed Lomography site selling it for around $250 when you can buy it for $80 – $120 with free shipping from Amazon with various discount offers and bargain deals. always check several places before buying. Plus don’t forget to buy several pairs of rechargeable CR2 batteries along with it. There might be a few other accessories for Mini 50s camera you might want to add to your list. You need to good case to keep it safe from dust and scratching. Also, you might want to buy a small cheap tripod if you like to have a good close-up and macro photos with the close-up lens you get along with the camera. 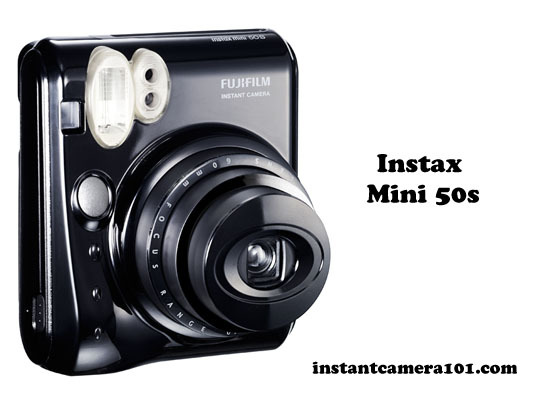 Fujifilm has released several Instax cameras since they launched Instax Mini 50s camera. There’s Mini 8 camera which is cheaper but lack for some features and Mini 90 camera which has lot more features but expensive like $180. This camera might look more elegant than those two new cameras but if your budget allows you I highly recommend you to consider the Mini 90. That’s probably the best Instant photo camera in the market today. There are several models of new Polaroid digital instant cameras too. But none of those cameras can be considered as cheap instant cameras if that’s what you are after. Polaroid z340 is a good camera. You get 3 x4 wide format photos and can save photos into the memory card and also move photos in or out. It let you check photos before print so you can save wasting photo paper been wasted. This is one feature Instax cameras lack since those are not instant digital cameras. A downside is z340 cost you around $250. Polaroid Z2300 camera use Polaroid mini film which is known as ZeroInk photo paper. This camera cost around $180 and it also get u save photos into SDHC memory card. 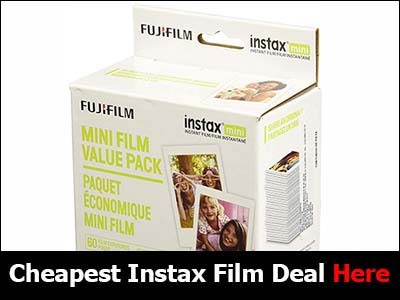 If you want a bigger 3 x 4 film format camera like Polaroid z340 but for a cheaper price then you can check Fuji Instax 210 which cost you only around $60 at Amazon. But there will be a newer model called FujiFilm Instax 300 available in the market from March 2015. It will be priced around $130 – $150. Both these cameras use Fuji Instax WIDE photo paper. Check this video if you want to see unboxing this camera. Old video but it’s shows everything you expect.